Although I find it a little funny that her friend gave this a week later, even when they see each other everyday, it's still very thoughtful of her to give this traditional Chinese birthday offering. 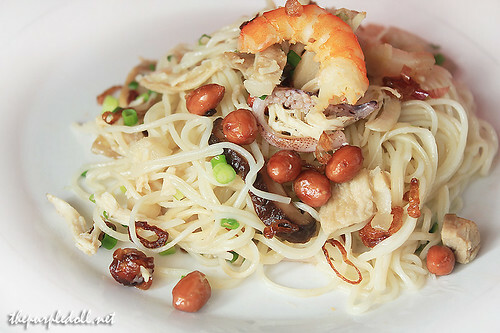 Her version is of misua noodles, topped with chicken meat, squid, shrimps, mushrooms, fried garlic, green onions and peanuts. My dad found the noodles a little oily, but nonetheless, very flavorful. How about you, what's your favorite kind of noodles? And do you usually serve noodles (of any form) in your birthday celebrations? So far, I've been a loyal fan of Lola Inda's Bam-i. It's very flavorful and the canton is always cooked just right. Gusto ko pancit palabok :)yung sa 2nd picture, may skin pa yung peanuts or ganyan talaga kulay? 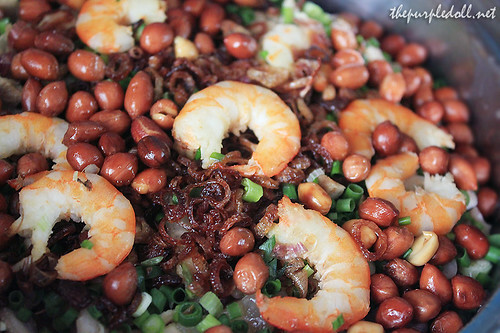 suddenly, parang gusto ko ng misua :( Personally, I prefer palabok and pansit bihon over canton. And I don't know if it's just me but I get full easily when I eat canton...maybe because the noodles are thicker?haha nonsense;p Onga, yung peanuts ganyan talaga? That blog is connected to our original one, http://thebackgroundstory.com. Your plating attempt is good! It made me hungry! I think i've tasted this and yes this noodle is a chinese dishes and i think i tasted this in Tondon at my mom's friend. My mom is chinese, but i dont look like chinese since my dad is ilocano LOL, and my mom is fond of buying and cooking chinese food, which i miss na naman. Hay... thanks for this post, it really reminds me about my mom. @Jeo and @Iamadie: Yung peanuts are still coated.. :) In Chinese cuisine, peanuts with coat/skin is usually used in the dish, like in kiampong rice (kiam peng). Requirement may noodle pag may birthday ... and I heart misua guisado and birthday noodles. good job! mukhang ansarap kahit hindi ako fan ng pancit..
Birthday noodles? Sorry sis. First time to hear about that. I wanna taste it! For instant noodles, favorite noodles ko ay Nissin XO noodles. Misua made me miss my Mama! She is a very good cook and she always cook birthday noodles during our birthdays!